During the dead of winter I was at the library with my son, in the kid’s section. I spotted a book on the reshelving pile called Square Foot Gardening by Mel Bartholemew. Intrigued by the picture on the front, I picked it up and glanced through. I was impressed and curious about what I saw inside. I took it home with me and waited impatiently for the growing season to begin. A special soil mix fills the boxes – you don’t use existing soil, which means you can put your garden anywhere you like, with minimal digging/weeding/etc. I live in a fairly urban area, so my backyard is about the size of Buckingham Palace’s bathrooms. In past years, I tried to garden on the side of the house, but you know what they say – out of sight, out of mind – and by midseason, my garden would invariably be a tangle of weeds and crowded, sickly plants. Last year I attempted to do all my gardening in containers on the deck, but that failed even more miserably as I wasn’t able to keep them watered properly. I assumed gardening just wasn’t for me and that I would never grow more than a few tomato plants. Sorry for the cell phone picture! The soil, Mel’s Mix, is a blend of 1/3 each of vermiculite, peat moss, and compost. The vermiculite and peat moss I was able to buy at our local nursery, and we’ve been composting kitchen scraps for years, so I had no shortage of compost. You fill the boxes and affix some sort of grid to the top. I stapled mini-blind slats to the boxes to create my grid – each box held 12 1′ squares. 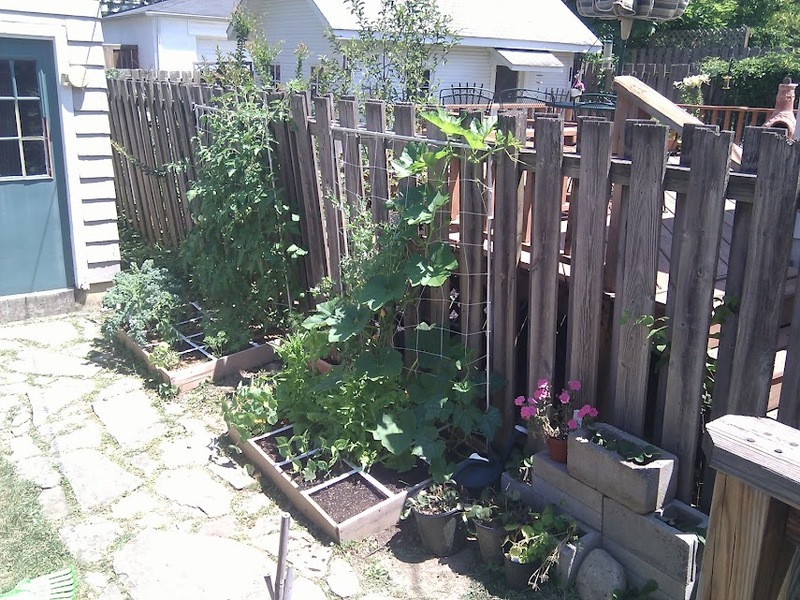 In addition, I built trellises for each box for vertical gardening. I made these out of electrical conduit, cut to size, and attached at the corners with some plastic plumbing parts. Each trellis was slid over rebar hammered into the ground, which both keeps them vertical and gives you the option to put the trellis away when it’s not in use. Finally, I tied nylon trellis net (available at garden centers) to the top and sides to form the trellis itself. These fixtures are extremely strong, and have held up in 70 mph+ winds. Here is a great video tutorial on building your trellis. Now, we’re mid-summer, and here is a list of things I have successfully grown in just 24 square feet of previously unused yard space: kale (2 plants), basil, cilantro, peas (16 plants), carrots (2 squares), onions (2 squares), tomatoes (4 plants), nasturtium (2 plants), microgreens, green beans (3 squares), lettuce (3 squares), squash – but I’m not sure what kind yet, they were volunteers – pumpkin, maybe?, Serrano peppers, and spinach. The kale, tomatoes, and squash have done particularly well – my tomato plants are over 12′ tall, and just LOVE the trellis. I’m harvesting at least 20 cherry tomatoes a day off a single plant. The squash has sort of taken over – it covers the entire trellis and has moved on to the rest of the yard and is trying to annex my neighbor’s yard as well, so I have to keep it in check. At the moment I have about 6 empty squares just waiting for fall’s crops to go in. If you’re interested, the best place to get started is Mel’s book, but there are lots of resources available online to help you, too. One excellent reference for plant spacing and other information specific to SFG is My Square Foot Garden. So, what I’m trying to say is that I can’t believe this gardening technique isn’t more popular. I haven’t even listed half the benefits – it’s amazing what a little fresh thinking has done to revolutionize what is a centuries-old process. The simple, line-drawn illustrations are clear and easy to follow. The book is written in a friendly and conversational style that makes it a pleasure to read – educational and entertaining, to boot! Included as a bonus is a full-color section of great wirework examples from various artists, which serves both as inspiration and motivation. If you’re interested in learning to make jewelry, I cannot recommend this book enough! Can a 3-Year-Old Be King of the Koopas?